Happy Friday, all! 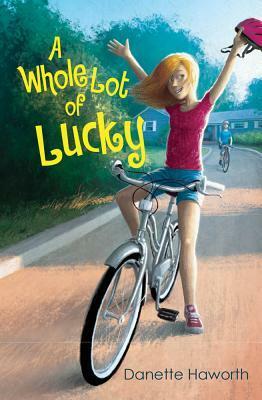 Today’s book giveaway is Danette Haworth’s A WHOLE LOT OF LUCKY, which I really, really loved. It’s about a girl whose family wins the lottery, one of those pitch-perfect books for middle school kids. If you leave a comment on today’s post before 11:30 EST Saturday night, you’ll be entered to win a copy from Danette. So…I’m not sure if you can hear it from where you live, but every Friday when I read your update posts, I cheer. With great gusto. Just in case I’m not loud enough, though, we have a special guest author visiting to cheer you on today. Sarah Darer Littman, who writes fantastic books for teens, will be popping in to join our conversation today, too. I’m always dissatisfied with myself. When I stop to really think about it, though, I’ve come a long way. Last year at this time I was just beginning to rediscover myself as a writer. I’d set up my first blog and tentatively started sharing my voice with the universe. Last week I spent mostly doing “journalistic” style writing for the conference I attended (my official job was to attend keynotes and write up summaries for the newsletter). I burn the candle on both ends while there, so it took me several days at home to regroup and wake up again. I’ve gotten a little bit done on my “official” WIP this week (shared some at Gae’s site) and I even found the courage to pull up the story I adored 12 years ago to see if anything can be done with it. Good news? I don’t hate it. *grins* Happy writing, all. I read a wonderful post on Lisa Papa’s blog yesterday that addresses never being satisfied with one’s writing. I thought I’d share it here. Hope you find it helpful. Thanks! That was floating around twitter, too… and it was SOOO good! I recommend everyone read that post. I have always appreciated and envied the hard work of writers. Putting myself in their shoes on an (almost) daily has put things in greater perspective. At this time I am not looking to produce a story, but to dabble in writing to be able to empathize, encourage and teach my students the process of writing. Thank all of you for all you do; writing for our children and guiding teachers to write more and better. Happy weekend, happy writing. Daily doses of writing in 15-20 minute increments in the richly prompted Teachers Write! universe has me with about 20 pages to date. The results are disjointed, quirky and uneven. I’m fine with that, and I’m even beginning to see a couple of WIP possibilities. I also feel life’s competing demands encroaching, including back-to-school responsibilities in two weeks. For now, I’m enjoying the writing routine that Kate, other generous authors, and the rest of us are creating, and I’m wondering where I’ll find the will to sustain it in August and beyond. Can I maintain a daily habit? Or will it be shunted to weekends, vacations, (gulp) summer 2013? I was truly amazed this week at how a very specific prompt could actually free me up to write, instead of inhibiting what I had to say. The rest of my thoughts are much like Brian’s–Can I keep school from being so all-consuming to fit in not just writing, but more of life? Thanks to all of the authors who put their writing schedules out there to show me it is possible. Brian and Wendi–It can be done. I teach full-time (4th grade), have 2 small kids, and I write almost everyday, even when school is in. There are days when it is VERY hard, but because I need to write, I feel cranky if don’t do it. I usually have to wait until my kids go to bed. I may only write for an hour or two a night, so my progress is slow, but steady. While I don’t have a book published yet, I’m a lot closer than I was a few years ago. And a bonus, I can talk to my students genuinely about how to revise and how to get going on a writing project because I am doing it in my own work. We start school the day after Labor Day, so I always give myself September to get involved with school and not be so hard on my writing life. However, I’ve found that I’m so into my summer writing routine, that I still write in September, even if it’s only a little bit each night. You can do it!!!!!! Am feeling disjointed this summer and not very writerly -sigh. Am happy with one project, but struggling to engage in another. *deep breath*. Perhaps I should write a personal ad for inspiration: Struggling author seeks muse for summer rendezvous…. Thanks for reading. Hope I can shake this at THE PARTY this afternoon. It’s been a good week. I’ve been able to rewrite the beginning chapter of my novel based on Les Edgerton’s HOOKED (thanks to Anne Marie Pace for the recommendation). I also worked on Darcy Pattison’s shrunken manuscript technique on my middle grade WIP. Now I’m replotting to see what plot points to keep, which ones to add, and which ones to get rid of. Busy, busy, but productive week. My daughter loved Danette’s book Summer of the Moonlight Secrets! I recommend it for middle grade readers, and I am sure A Whole Lot of Lucky is just as captivating. I was at a conference earlier this week and did not have a lot of time to write. However, I am catching up on what I missed and will be plugging away this weekend. I have never written nonfiction so this week’s challenges were something new for me. When I was 10 we had the assignment to write a poem and I was stumped. So I dug out my beloved Childcraft encyclopedia (weird, I know) to get ideas and wrote a poem about Dolley Madison saving Washington’s portrait. It was published in the school newsletter and my parents were so proud. So on a whim I spent the rest the day this week researching Dolley Madison. She is a fascinating lady and I learned about her tragic dealings with her son, which I had never known. I may make a model picture book for my students with the research material but even if I don’t, it was a rich learning experience that I can share with them. I would not have had this esperience without Teachers Write! Haha! Kristina, explaining the typo–the sign of a true writer! Georgia–Thank you for your kind words! This week has been so busy, but I have been reading, writing, and revising. I am heading on vacation in the middle of next week, and I will miss Teachers Write (very little Internet access), but I am hopeful that I can stick to my writing goals. Thank you again for this great opportunity! I thought I would get a lot more writing done, as my son was at soccer camp. I now truely understand my third grade students and why they are distracted much of the time. All in all it was a good week. I worked on research for my story and I even wrote a poem when it finally started to rain! I have one more week before I start teaching summer school and am already thinking of a schedule I can keep, so that I write everyday. I am thoroughly enjoying The Brilliant Fall of Gianna Z. I have to tell you, Kate, that the comment on p. 39 about the “puke-green parka” almost made me fall off my chair! When I first moved to Michigan at the age of 10, my father had retired from the Air Force, so we joined civilian life. What a shock for this geeky kid with a southern accent to all of a sudden be among kids who had grown up together and knew nothing of the kind of life I had led, moving every year of elementary school, usually in the middle of the year. We moved from Virginia, and I don’t remember if I even owned a coat before moving to the Detroit suburb we now called home. For some odd reason, the coat I ended up with was, like G.’s, “puke-green,” and my friend Kathy made fun of it ALL the time. I will never forget that coat, or the crummy way I felt every time she poked fun at me for it. Thanks for bringing this book to life for me in so many ways, and for making Gianna someone I could relate to, 38 years later! Starting today, I am on VACATION (staycation) for a week. Know what that means? Time. To. Write. More. I’ve missed lots of Teachers Write! lemonade the past two weeks, travelling thousands of miles with my hubby on our 25th anniversary, but I surprised myself by writing more than I expected while away. My task was to populate existing scenes with more actual people, so my MCs weren’t living in a void. I don’t know why I dreaded it, because it was truly like meeting a whole new bunch of people in my book. It was really quite an exciting experience, and I had a hard time ending my lunch hour today, writing more into a character in a totally different place in the book than he had appeared before. This is a fascinating ride. Very different from writing my nonfiction.